ALL EYES WILL be on Croke Park this Sunday as Munster neighbours Limerick and Clare do battle for the right to meet Cork in this year’s All-Ireland hurling final. RTÉ kick off their live TV coverage from Headquarters at 1.15pm with the minor semi-final between Limerick and Galway (1.30pm). For the senior clash, host Michael Lyster is joined by Eddie Brennan, Liam Sheedy and Tomas Mulcahy with Ger Canning and Donal O’Grady on commentary. The Sunday Game that evening will have all the highlights of the day’s action with Des Cahill joined by Cyril Farrell, Donal Óg Cusack and Michael Duignan in the studio. RTÉ Radio 1 will have live coverage of the game as part of Sunday Sport while Limerick’s Live 95FM will also be in Croke Park with commentary on both games from 1pm – 6pm. The ladies take control on Saturday and RTÉ.ie will have live online coverage of both Liberty Insurance Senior Camogie semi-finals from Semple Stadium. Cork play Kilkenny at 2pm with defending champions Wexford taking on Galway at 4pm. Over on TG4 it’s football with the first two quarter-finals down for decision. First up at 4.15pm is Galway v Tyrone, with Laois v Monaghan to follow at 6pm. Gráinne McElwain presents, with commentary by Brian Tyers. Presenter Marty Morrissey is joined in studio by Dublin hurler Liam Rushe to reflect on last Sunday’s defeat to Cork; Galway star Joe Canning; and Michael Ryan who will speak exclusively about his decision not to go forward for another season as Waterford hurling manager. 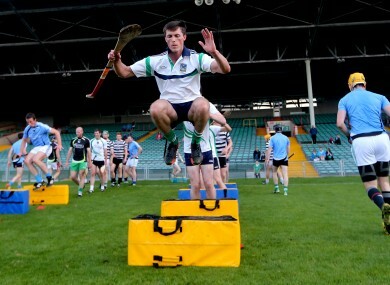 Limerick’s Seanie Tobin is the man for The Hot Seat Quiz while the panel will also look forward to Limerick v Clare. Presenter Kieran McSweeney is joined by Dublin hurler Niall Corcoran and the Sunday Independent’s Damien Lawlor to reflect on the Dubs loss to Cork in the All Ireland Hurling Semi Final. John Allen and Davy Fitzgerald both give their thoughts ahead of Limerick v Clare. Host Dara Ó Cinnéide will be joined by panellists Donal O’Grady, Evanne Ní Chuilinn and Cathal Moore to look ahead to Limerick v Clare. Email “Here’s your GAA coverage on TV and Radio this week”. Feedback on “Here’s your GAA coverage on TV and Radio this week”.